(Nanowerk News) Carbon nanotubes (CNTs) are microscopic tubular structures that engineers "grow" through a process conducted in a high-temperature furnace. The forces that create the CNT structures known as "forests" often are unpredictable and are mostly left to chance. 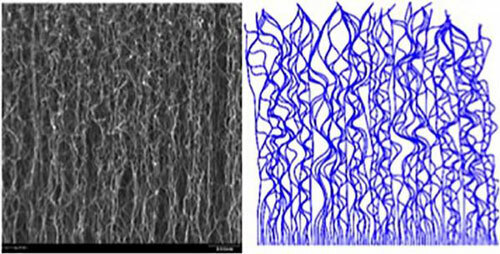 Now, a University of Missouri researcher has developed a way to predict how these complicated structures are formed (Carbon, "Integrated simulation of active carbon nanotube forest growth and mechanical compression"). By understanding how CNT arrays are created, designers and engineers can better incorporate the highly adaptable material into devices and products such as baseball bats, aerospace wiring, combat body armor, computer logic components and micro sensors used in biomedical applications. CNTs are much smaller than the width of a human hair and naturally form "forests" when they are created in large numbers (see photo). These forests, held together by a nanoscale adhesive force known as the van der Waals force, are categorized based on their rigidity or how they are aligned. For example, if CNTs are dense and well aligned, the material tends to be more rigid and can be useful for electrical and mechanical applications. If CNTs are disorganized, they tend to be softer and have entirely different sets of properties. "Scientists are still learning how carbon nanotube arrays form," said Matt Maschmann, assistant professor of mechanical and aerospace engineering in the College of Engineering at MU. "As they grow in relatively dense populations, mechanical forces combine them into vertically oriented assemblies known as forests or arrays. The complex structures they form help dictate the properties the CNT forests possess. We're working to identify the mechanisms behind how those forests form, how to control their formation and thus dictate future uses for CNTs." Currently, most models that examine CNT forests analyze what happens when you compress them or test their thermal or conductivity properties after they've formed. However, these models do not take into account the process by which that particular forest was created and struggle to capture realistic CNT forest structure. Experiments conducted in Maschmann's lab will help scientists understand the process and ultimately help control it, allowing engineers to create nanotube forests with desired mechanical, thermal and electrical properties. He uses modeling to map how nanotubes grow into particular types of forests before attempting to test their resulting properties. "The advantage of this approach is that we can map how different synthesis parameters, such as temperature and catalyst particle size, influence how nanotubes form while simultaneously testing the resulting CNT forests for how they will behave in one comprehensive simulation," Maschmann said. "I am very encouraged that the model successfully predicts how they are formed and their mechanical behaviors. Knowing how nanotubes are organized and behave will help engineers better integrate CNTs in practical, everyday applications."